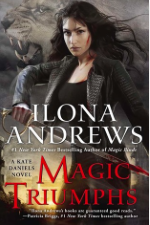 This is the tenth and final book in the urban fantasy romance series Kate Daniels by Ilona Andrews. NO spoilers ahead! Firstly I have to shout: I LOVE THIS SERIES!! Kate is so badass and this never lets up throughout the series. The romance builds slowly across multiple books so it’s not the main plot and doesn’t overshadow all the action. The world building is super unique, with magic and tech fighting for dominance in a way that makes this urban fantasy one that’s feels at times both modern and historical. The “vampires” in this are mega creepy and not the swoon worthy creatures I usually read about – in this series the swoon is reserved for all the shifters. This series finale was at times high stakes and heartwarming. It being the 10th book we know there’s going to be a big show down but we also know that our main characters should be getting their well deserved happy ending for the family they’ve all worked so hard to build and protect together. Individually it wasn’t as suspenseful or gripping as other books in the series but overall I thought it was a really satisfying ending to an unforgettable series. The books are binge worthy and quick reads, so now that they’re all published there’s no time like the present to knock this series out! If you love urban fantasy, badass female leads, shifters, a creepy take on “vampires”, a unique urban fantasy world, and slow burn romance that takes a backseat to the action, then this is the series for you! My SIL recommended this series to me in January along with a Patricia Briggs series but I’ve been putting it off all year. After reading this it sounds like I may enjoy it more than I thought! Yassss! It’s such a fun series! In the first book you’re really just thrown right into the world so you kind of have to work out for yourself what’s going on at first, I was a little confused initially so be warned on that but you pretty quickly start to figure things out.